ATLANTA — Disruption is increasingly happening for freight movers as they seek to cross the United States’ borders with Mexico and Canada, and it’s not the positive technological change often associated with that word. 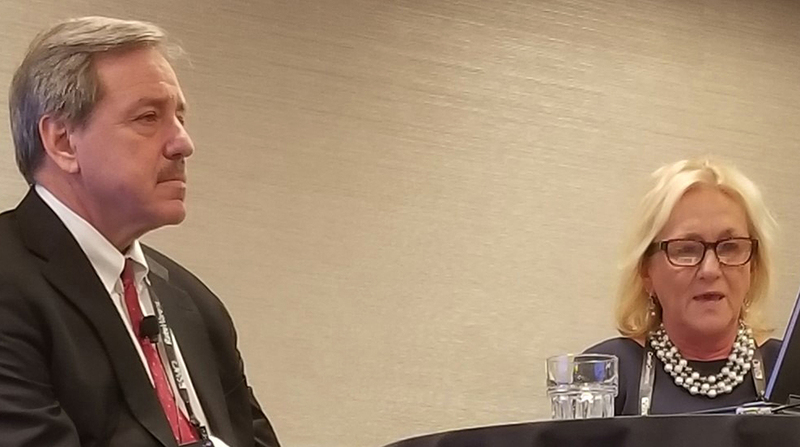 Instead, it’s delayed freight or higher costs, as tariffs and uncertainty about the reworked NAFTA trade agreement are vexing trucking companies as they seek to do business in North American markets, according to two speakers at Jump Start 2019, SMC3’s 28th annual conference. And despite President Donald Trump signing a new trade pact with Canada and Mexico — known as USMCA — it has not been ratified by Congress. The now-ended government shutdown will delay reports to Congress on USMCA, according to Candace Sider, vice president of government and regulatory affairs for Livingston International, a customs brokerage and compliance consulting firm based in Toronto and Chicago. “It’s very unlikely we are going to see anything in terms of ratification … by the end of 2019,” Sider said at a Jan. 28 forum. She said she is concerned about Trump’s tariffs and trade policies because they often lead to a “false economy” propped up in the short term by tariffs and a slowdown in imported goods. Sider said small supply companies could start to feel the pain of Trump’s trade policies soon, especially if their profit margin is about 10%. On the Canadian side of the border, federal elections will be held in the fall, casting doubt on quick Canadian ratification of USMCA, Sider told an audience of logistics and trucking executives. It’s all the more vital that shipping documentation is complete, she said. Details are driving the difference between goods affected by tariffs and goods not affected by tariffs, Sider said. Slapping a label of “Pampers” on a shipment of baby diapers won’t cut it with Canadian customs officials, she added. Given the nature of supply chains, shipping and trade policies, companies should be prepared for further disruptions in North American trade, Sider said. On the southern side of the U.S. border, there are differences not necessarily affected by trade disputes. “One of the big disrupters is lack of education on international trade,” said Federico Zuniga, executive director of the Educational Institute of the National Customs Brokers and Forwarders Association of America, or NEI. Zuniga said he knows of members of Congress who had to tour the border to get an idea of the type of trade that Mexico and the United States conduct daily. In just one day, Zuniga said, about 18,000 trucks cross the Rio Grande at just the Laredo, Texas, border point alone. Customs officials claim they can clear trucks in 15 seconds at the border, Zuniga said, but one significant delay can back up hundreds of trucks. For one, Mexico and Canada collect value-added taxes (VAT) at the border, when goods are imported, which complicates the process, Zuniga said. Mexican brokers also are responsible for the entry, not the importer of record, he said. That means fines and even jail time fall on them. “[Brokers are] definitely going to slow the process down and make sure everything is in line,” Zuniga said. Mexico also doesn’t have bonding, unlike Canada and the United States. Bonding protects the government revenue, he added.